TAMPA, Fla. – The 2018 USL season saw 1,655 goals scored across the regular season and playoffs – including a bevy of spectacular finishes from some of the league’s top players – but now the time has come for you to decide which one was the best of all. 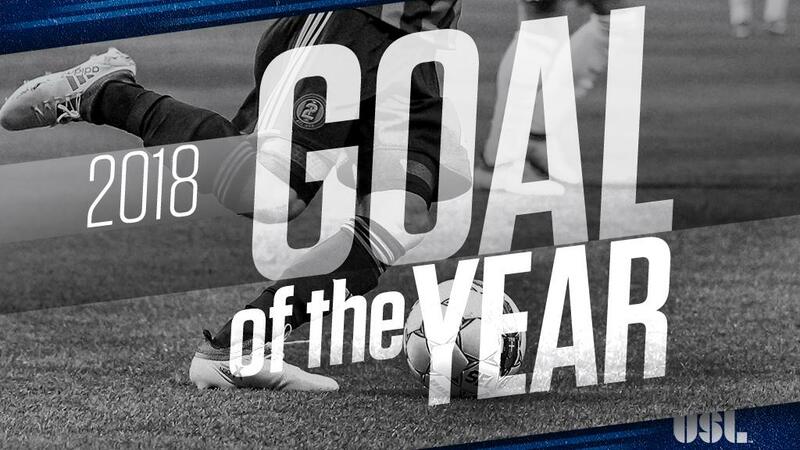 Voting for the 2018 USL Fans’ Choice Goal of the Year competition opens Monday with 12 strikes vying for the top prize in a knockout format that will be decided entirely by a fan vote on USLChampionship.com. The opening two rounds of voting will trim the field to three, before a fourth semifinalist will be chosen from the nine losing strikes in "The Rebound" vote. Nine of the entrants earned their way into the Goal of the Year bracket by being named Fans' Choice Goal of the Month/Goal of the Playoffs winners while two of the remaining three slots were filled by Goal of the Month contenders that garnered high percentage of the vote despite ultimately falling short of the number one spot. Sammy Ochoa’s stunning strike for Las Vegas Lights FC rounded out the 12-goal field by finishing top spot in the Fans’ Choice Last-Chance Vote last week. Now it’s your turn to narrow the field even further in the first round of voting for the USL Fans’ Choice Goal of the Year award. Voting will continue through 12 p.m. ET on Monday, December 3. Jesus Enriquez (RGV) - #FRSvRGV, 5/9/18: Enriquez produced a dazzling finish from the top-left corner of the penalty area that gave the goalkeeper little chance as it curled into the top-right corner of the net when the Toros earned 2-2 draw in Fresno. Cristian Portilla (OTT) - #TORvOTT, 9/6/18: Portilla’s olimpico from a corner kick on the right was judged to perfection as it curled into the left corner of the net in Fury FC’s 4-3 victory against Toronto FC II. Jorge Herrera (CLT) - #CLTvNC, 10/13/18: Herrera went for the spectacular and connected sweetly with a stunning, left-footed bicycle kick that found the left corner of the net and landed at the No. 3 spot on ESPN’s SportsCenter. Wan Kuzain (SPR) - #SPRvTUL, 8/29/18: Kuzain produced a spectacular free kick that landed him on SportsCenter’s Top 10 for the second time this year, firing a dipping shot that picked out the bottom-left corner at Children’s Mercy Park. Cameron Lancaster (LOU) - #LOUvIND, 10/20/18: The 2018 USL Golden Boot-winner notched a spectacular finish from a free kick that provided the cherry on top in Louisville’s 4-1 victory against Indy Eleven in the USL Cup Eastern Conference Quarterfinals. Kenney Walker (CIN) - #CINvOTT, 4/28/18: Walker unleashed a remarkable volley from 50 yards out that flew into the right corner of the net, earning the FCC midfielder top spot in ESPN’s SportsCenter Top 10 that night. Franck Tayou (FRS) - #FRSvSAC, 6/30/18: Tayou introduced himself to Foxes fans with a memorable first goal for the club as he blasted home a finish from 70 yards against Highway 99 Derby rival Sacramento Republic FC. Jason Johnson (PHX) - #PHXvTUL, 6/16/18: Johnson landed at No. 2 on SportsCenter’s Top 10 for an incredible scissor-kick finish from 15 yards that found the top-left corner of the net to leave fans and teammates stunned. Lagos Kunga (ATL) #CLTvATL, 3/31/18: Kunga’s first professional goal saw the former U.S. U-20 international weave down the goal line past two defenders before producing a tight-angle finish at the near post. Alex Bruce (SA) - #SAvOKC, 7/4/18: Bruce came off the bench and fired a spectacular curling finish from 25 yards into the top-right corner that earned his side a point against visiting Energy FC.